NYSSBA's programs and services – organized around the Association's goals to provide advocacy, information, leadership development and custom services for school districts – are designed to help school board members advance the cause of public education for the children of New York. NYSSBA provides member boards with skillbuilding and informative education programs, publications and consultant services. It represents the views of its members with legislators and policymakers in Albany and Washington, D.C. NYSSBA also stands ready to assist members with legal questions, negotiation advice, policy guidance, communications activities, research needs and much more. Many of the services and publications NYSSBA offers are free to members. For members who need special assistance, NYSSBA offers a wide array of leadership development and customized fee-based programs and services. This allows the Association to keep membership dues at stable levels while providing a greater level of services to member boards when the need arises. NYSSBA's advocacy efforts on the state and federal levels are directed by the 5,000 locally elected officials that comprise its membership. As NYSSBA members and locally elected education leaders, board members are in the best position to identify those issues that most need the support, time and attention of the Association. Issues go to the full membership through the resolutions process. Proposed resolutions are passed by a member school board or NYSSBA's Board of Directors and submitted to NYSSBA for consideration by member delegates at the Annual Business Meeting each October. Adopted resolutions become the position statements that form NYSSBA's legislative agenda. 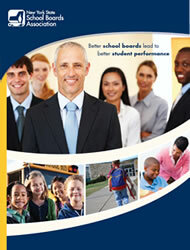 NYSSBA provides vital information to help your board make informed decisions. This is a website that provides comprehensive resources for individuals interested in learning about school board service. It offers a virtual journey from the decision to run for school board to the first year of service. NYSSBA offers a variety of handbooks and guidebooks for school board members on subjects such as the 35th edition of School Law (reduced fee for members), the Superintendent's Contract Guidebook (free to members), and School District Obligations Under the Open Meetings Law (free to members). NYSSBA keeps school district officials up-to-date on the latest in education news from around the state by providing E-Clips, a free e-mail clipping service delivered each day, with stories from 26 newspapers across the state. Simply click on the headlines to access the full story on the newspapers website. Board members, superintendents, district clerks and other key district personnel of NYSSBA's member school districts receive e-mail newsletters from their NYSSBA Area Director bi-weekly, keeping you up-to-date on all of NYSSBA's activities, events and accomplishments. NYSSBA maintains a data base with information on decisions regarding the discipline of tenured teachers and administrators under section 3020-a of the Education Law to assist school districts and their school attorney in their preparing for, and participation in such proceedings. NYSSBA offers a variety of leadership development opportunities, both in the classroom and online, to meet your leadership team's developmental needs. Under NYSSBA’s training program, School Board U, NYSSBA provides the skills you need to meet the ever-changing challenges of board governance and fiscal accountability with a training program designed to enhance your leadership skills. Whether you are a newly elected or seasoned board member, our training program is designed for you! School Board U also acknowledges the extensive time and effort school board members devote to professional development with a point-based recognition program. NYSSBA’s premiere event held in October is the largest statewide gathering of public education leaders in New York. The convention consists of more than 100 education sessions, state and national speakers, special networking events, the premiere pre-convention School Law Seminar and all aspects of district governance and student achievement. It also includes a variety of student performances and displays as well as one of the largest exhibitions of educational products and services in the state. (fee-based). Offers mandated Fiscal Oversight Fundamentals (six hours) and Essentials of School Board Governance training through workshops in a two day program in regional locations around the state. By participating in NYSSBA’s core training curriculum, new school board members sharpen their governance and fiscal skills and meet their mandated requirements while becoming familiar with board roles and responsibilities, policies and procedures, legal rights, fiscal duties, and more! (fee-based). For board officers or those who aspire to become one. This full day training will take you through an interactive agenda focused on the officer’s role in effective governance, leadership and accountability. NYSSBA investigates companies that offer services that districts need. We've done the research to find reputable companies that can offer your district outstanding services at reasonable rates. For more information on these programs, contact NYSSBA at (800) 342-3360 or via email at info@nyssba.org.